OAKLAND — Under increased security and in a special courtroom with its own metal detector, four men associated with Your Black Muslim Bakery appeared before a judge Monday but had their hearings postponed because of a lack of representation. Devaughndre Broussard, 19, Tamon Halfin, 21, Joshua Bey, 20, and bakery leader Yusuf Bey IV, 21, all were supposed to enter pleas Monday morning before Alameda County Judge Morris Beatus but could not because they did not have attorneys. Broussard is charged with the murder of Oakland Post editor Chauncey Bailey while Halfin, Bey and Bey IV are charged with kidnapping and torture stemming from a May incident in which the three men are suspected of using a fake police cruiser to kidnap two women. Police said Broussard confessed to killing Bailey two weeks ago because of a story Bailey was working on about the bakery’s financial troubles and warring factions. But Broussard said in a television interview last week that he was beaten by police until he admitted to the killing. Police denied Broussard was beaten into giving a confession. Before the hearing Monday, Broussard’s relatives continued to argue that the 19-year-old was beaten into making a confession and said an attorney they hired to represent the teenager was denied access to the jail over the weekend. In a letter Harris distributed to reporters Monday, San Francisco attorney LeRue Grim claims he attempted to visit Broussard on Saturday but sheriff’s deputies denied him access. “I presented all my credentials to the lady at the front window and was told since I was not on her computer as the attorney of record I could not see you,” Grim wrote in the letter. 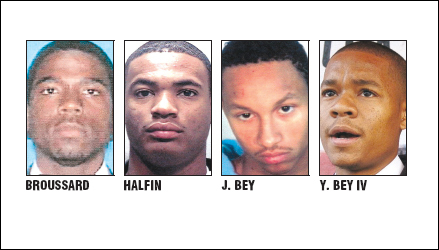 All four men are due back in court this week.